Trust me, I didn't come up with that name. 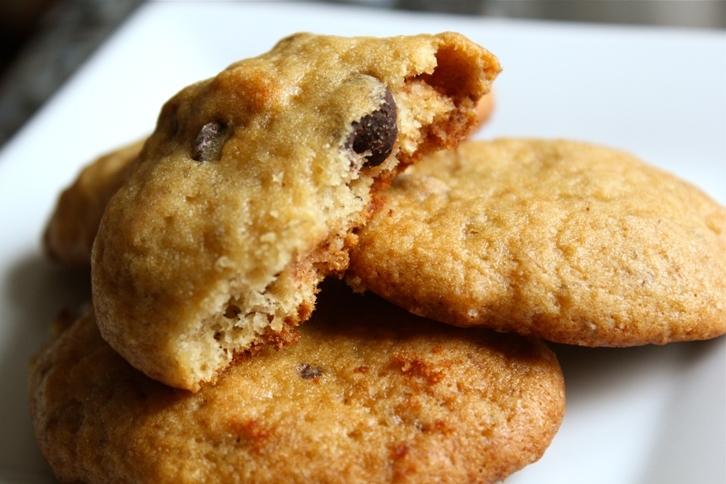 I found the recipe for these cake-like cookies via an iPhone app called Big Oven. (Mr. Ninj heard about it on NPR and suggested I check it out.) It's an online cooking community and repository of user-submitted recipes. One of its coolest features is called "Use Up Leftovers" -- you can enter up to three ingredients and it will suggest recipes using those ingredients. This week I had a few bananas beginning to turn scary-brown. I thought about banana bread, but that just wasn't doing it for me. So I typed "bananas" into the Big Oven app. I got many results for banana bread: Easy, Quick, Crazy-Healthy, Best-Ever, Dad's, Not Yo Momma's and more. Then I came across Da Bombs. I liked the recipe because its ingredient list was very detoxy (only 2 tablespoons of butter, folks) and its directions simple. Not to mention that each cookie has only 72 calories and 2.4 grams of fat! And the reviews were glowing. Da Bombs are more like a small cake than a cookie (much like the pumpkin hermits or eggnog cookies you've seen here). They taste like a cross between banana bread and chocolate chip pancakes: no lie. 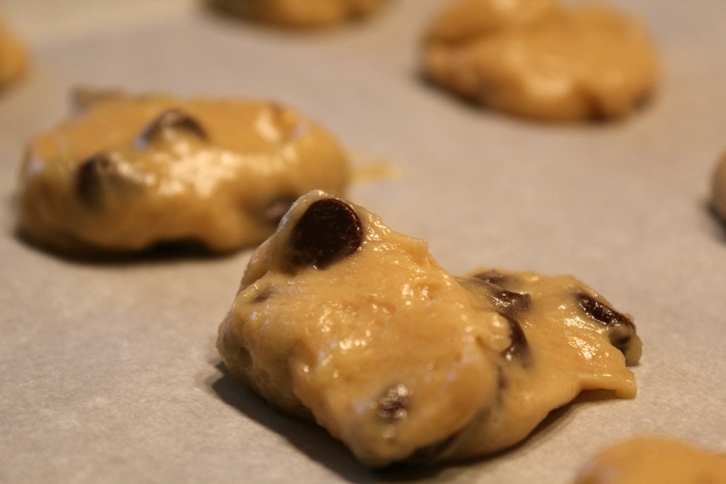 And, speaking of pancakes, if you omit the chocolate chips, I think these could totally pass as breakfast cookies. Or bake sale fodder. Because Big Oven consists of all user-submitted recipes, I cannot be 100% sure of the recipe attribution on this one. Their site dictates that users should not submit recipes or photos which are not original but I have no way of knowing if everyone abides by the rules. So as far as I know, this recipe was created by Big Oven user "bjellison" -- if that's you, let me know. If this really came from somewhere else, sorry -- I do what I can. In a small bowl, whisk together the flour, baking soda and salt and set aside. 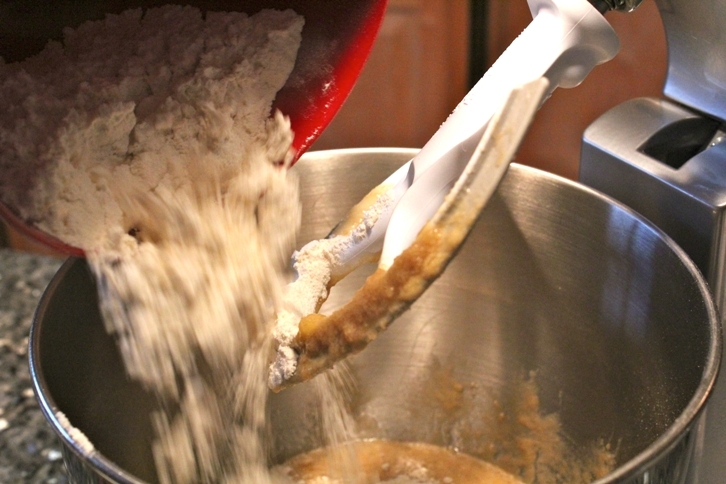 Beat the butter and sugars in a mixer until smooth. Next, beat in the bananas, egg and vanilla. Add the flour mixture and mix until it forms a doughy batter. Stir in the chocolate chips. Drop dough by heaping teaspoonfuls onto cookie sheets lined with parchment paper (they will spread a little so give them some room). Bake for 10-12 minutes or until springy. Cool on wire racks. Note: my yield was 3 dozen cookies. I hear you have plenty of bananas for it! OMG what perfect timing! I have 3 bananas that I've been needing to use up, but I'm not a huge fan of banana bread. Can't wait to go home and make these babies! I made them, they're great! I'd classify them as muffin tops--which are totally a breakfast food. I did vary the recipe a bit (ok, really a lot) based on what I had. I used self-rising flour, omitting the salt and baking powder, I used 3 bananas, I didn't have brown sugar so I used all white. what else? oh yeah, after I measured out my chocolate chips there were only about another 1/4 cup in the bag, so I threw those in. I added more flour, too, since the bag was nearly empty. Even with all my ... er... adaptations they came out great! so clearly they're hard to mess up, because I tried.